I recently got a router, so now I can go online using my laptop anywhere in the house. I think my favorite place is in bed. I can stitch, watch T.V. 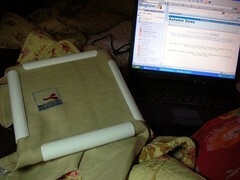 and read my blogs while lounging on my feather pillows and snuggled under the blankets. It's luxury! January looks great. The over one stitching is really nice. 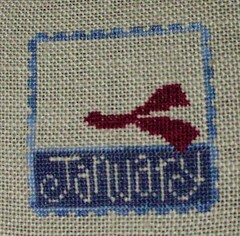 It is really cute, I love stitching over one for a change. We have wireless and a laptop, life is good although I do tend to spend a bit too much time on the internet :-). I love both those January's you've done. Great having wireless connection isn't it. I must admit though, I've never yet used it in bed. The monthly designs are so cute! Been stitching over one for about a year now, cant seem to break the habit, lol. And that is luxury, been thinking of a laptop to do the same, lol. The stamp start is cute. I really like January. Awesome. Ann. Your LK looks great for January - both of them! I too have a router that lets my laptop (one of the 4 computers in the house) be wireless...stitching and surfing...life gets no better! Your January stamp looks great! It's awesome over one.